My family isn’t Chilean, but my parents lived in Chile for two years. That’s where they fell in love, and when the returned to the United States, they brought some of the country’s traditions with them. 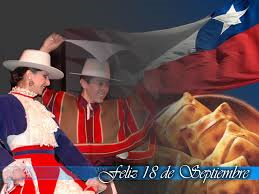 And we always had a traditional Chilean meal on September 18. I don’t celebrate Dieciocho de Septiembre now. But I always remember it. Posted on September 18, 2013, in Family, My life, perspective and tagged 365 reasons to smile, childhood, chile, Family, holidays, musings, perspective, smiles, traditions. Bookmark the permalink. 115 Comments.